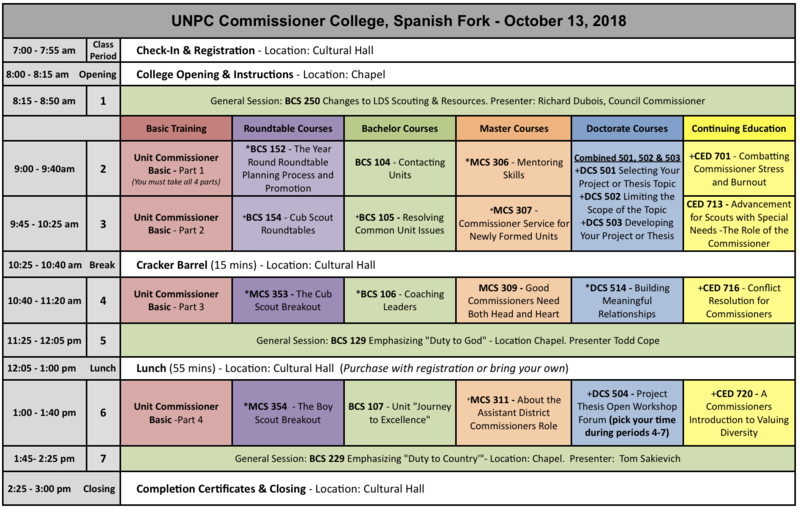 What is Commissioner College? Commissioner College is one of the best ways for sponsors of Scouting to receive initial and advance training and share experiences in their roles as commissioners (i.e. those who oversee, guide, and train adult volunteers in Scout unit programs). It’s modeled after a traditional college, with course requirements leading to Bachelors, Masters, and Doctorate degrees in Commissioner Science. The faculty is selected from among the most capable, experienced commissioners from our communities and Church youth leaders. FYI - The National BSA recently introduced some *brand new class offerings, revised/updated some old courses and others have been discontinued. Cancellation Policy: Please notify us at least 2 days in advance if you cannot attend. Walk-in Registrations are welcome, however, the lunch option will not be available then and we will need $10 cash to register. Please notify us at least 2 days in advance if you cannot attend.